Throughout the month of November 2017, buy one of the following Epiphone Masterbilt Century Collection Acoustic/Electric instruments from any participating Authorized Epiphone Retailer and get a FREE Clip-On Strobe Tuner. A winner from the U.S., Canada, and the UK/EU will be chosen December 1, 2017. Epiphone is proud to welcome Judas Priest guitarist Richie Faulkner to the House of Stathopoulo's esteemed group of Signature artists with his new Ltd. Ed. Richie Faulkner Flying-V. Faulkner joined Judas Priest in 2011 and his energy and incredible chops made an immediate impact on the band and their devoted fans. Longtime Epiphone Signature Artist Tommy Thayer of KISS is back with his third custom Epiphone, the new Ltd. Ed. Tommy Thayer "White Lightning" Explorer Outfit featuring the classic Explorer body in a Custom Metallic White finish plus Seymour Duncan® JB™ Humbuckers chosen by Thayer, Grover® Rotomatic machine heads, and a custom hard case. Over the past decade, Nichols has earned many prestigious awards like the Gibson Les Paul Tribute Contest and the Musician's Institute Most Outstanding Player. Epiphone Signature Artist Matt Heafy of Trivium is back with the new Ltd. Ed. 6 and 7-string "Sn∅fall" Les Paul Custom Outfits, Heafy's second series of custom Les Pauls, this time in inspired by Trivium's critically acclaimed album Silence in the Snow. 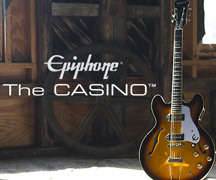 Ever since Epiphone joined the World Wide Web, players from around the globe have asked us for Epiphone t-shirts, hats, and other House of Stathopoulo "swag." Throughout the month of October 2017, buy one of the following Epiphone acoustic/electrics for $299 or more and receive a FREE Accessory Kit from any participating Authorized Epiphone Retailer. See your Authorized retailer for details. Last month at Summer NAMM '17 in Nashville, Epiphone introduced three new electrics, the Les Paul SL™ ($99), the Special VE™ SG ($169) and the Les Paul Studio LT™ ($249). All three Epiphone solid bodies feature powerful Ceramic pickups for the classic look and sound of rock's most iconic guitars, and all at unheard of prices in an array of color finishes to fit any occasion. At SXSW 2017, one of the industry's biggest "buzz" artists was Austin native Emily Wolfe who has been astonishing the jaded music press and fans alike with her commanding voice (courtesy of her favorite Epiphone Sheraton-II), lightning chops and rock steady band. At a time when electric guitar seems to be in decline, Emily and her band have made the case that its death is premature but that it just might be the savior of the record business after all. If you're a betting person, our money is on Emily.